In late September 2000, inside a remote Ontario fishing lodge, fourteen men and one woman were resting after six days on the water. The door banged open and two men strode in. Senator Joe Day and John Bodin, RMC Class of ’68, had driven along dark country roads in anticipation of a “seminal” event. What brought them all together and where were they going? Commodore (ret) Ed Murray, a former RMC Commandant and history buff, has asked Geoff Bennett, one of the original fifteen, to write the story that follows. The long and winding road leads eventually to one of the largest endowments at the RMC Foundation, named after Major Danny McLeod, legendary war hero, hockey coach and the first RMC Director of Athletics. · What does Chasse-Galerie mean? 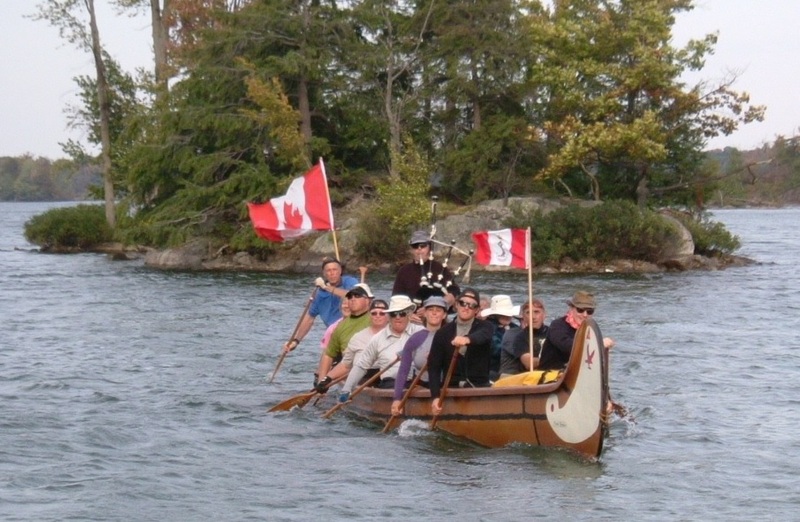 · Can you steer a fifteen-man canoe and sing “V’la l’bon vent” at the same time? · Is drinking Maudite a privilege or a punishment? · What is it like to paddle a canoe with a bagpiper standing beside you? · Is it true that General John de Chastelain court-martialed several crew members? · Who was responsible for the Mud Cut incident? · Was the canoe ticketed for speeding in Smiths Falls? · How do you get your class to agree on anything, let alone a gift to the college? After fifteen years in Jakarta, Indonesia, Wendy and I moved to Victoria, BC in 1999 with our youngest son, David. My mother Lem and my father 2435 BGen Bob Bennett had died a few years earlier. He had been the Old Brigade Adjutant up until shortly before his death and was a long-time booster of the military colleges. 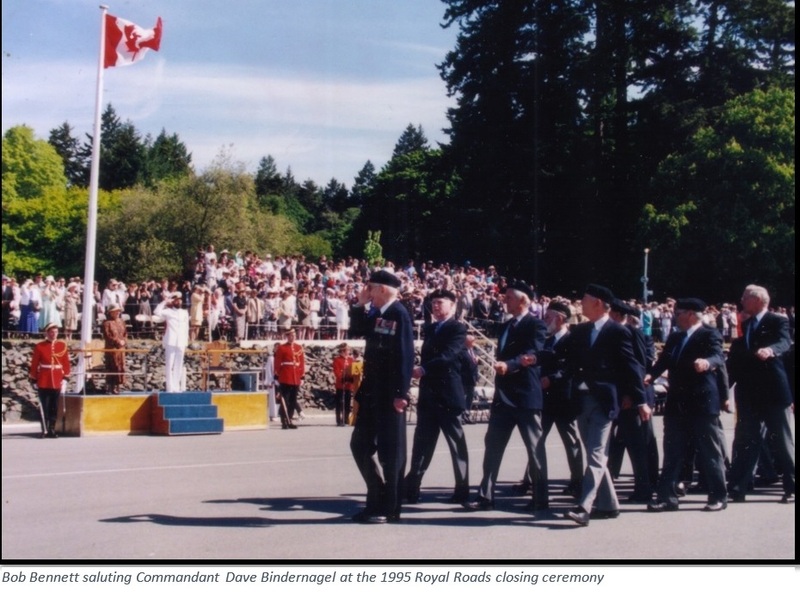 When Royal Roads closed in the spring of 1995, the former CSM of the Stone Frigate led the Ex-Cadet column on parade. Though weakened by cancer he saluted the Commandant, 9318 Captain (N) Dave Bindernagel, and marched off the square with dignity. When I finally returned to Canada I was determined to attend an RMC Reunion Weekend and to pay my respects, not only to the old soldier, but to his younger brother 2619 P/O Tom Bennett. Tom was BSM in 1940 and received the Sword of Honour from 943 Air Marshal Billy Bishop. He was shot down over the Mediterranean in 1942. 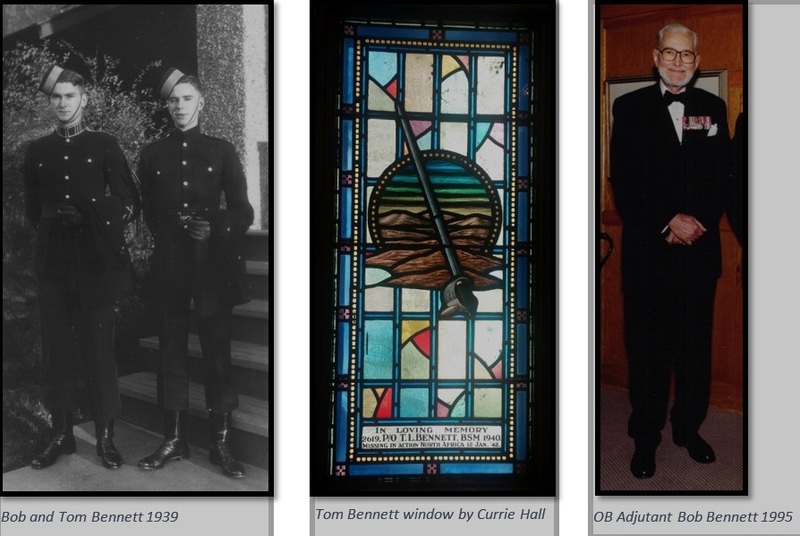 His name is inscribed on the Memorial Arch and a stained glass window by Currie Hall honours his memory. The last reunion I had attended was in 1976, five years after graduating from RMC. Although my Class of 71 had nothing special planned for the 1999 Reunion Weekend, I wanted to go anyway. I decided to get there by paddling to Kingston in a canoe along the Rideau Canal from Ottawa. Wendy asked, “Why can’t you just drive like everyone else?” It’s a long story. Like many Canadians, I grew up in canoes. When my parents built a cottage on the Big Rideau Lake in 1965 they bought a small red fibreglass canoe. My younger brother Robb and I paddled that canoe to Ottawa one summer. We used our father’s WWII vintage tent and sleeping bag and got soaking wet. On another occasion I paddled solo to Ottawa, sleeping under the canoe at night and carrying nothing but six turkey sandwiches. At the age of 14 my Scout buddy Bruce Phillips and I paddled from the Big Rideau to RMC and back. We nearly came to a nasty end on the River Styx downstream of Lower Brewers Lock. A southwesterly gale charged at us over the low hills, whipping up high waves in the shallow water. We left the winding main channel and tried to shortcut to the lee side. Deadheads lurked everywhere in the troughs. It took hours and several near misses before we arrived, exhausted, on the far side. On every trip since then, I have prayed to the wind gods and kept to the main channel. When we finally arrived at the dock beside RMC’s Old Gym, I distinctly remember meeting CPO Pitt, my future PT instructor. He didn’t look happy to see us. That was the same dock from which my father and his new bride, Lem, had launched their canoe in 1948 on a honeymoon cruise to the Upper Rideau Lake. The ill-advised trip nearly ended a few minutes later. She mutinied in high winds and waves going around Point Frederick and was sorely tempted to leave him then and there. When I look back at all those misadventures, I wonder why I did it. But time has a way of improving memories. So in the fall of 1999, my eldest son Richard and I launched the old red canoe at Dows Lake in Ottawa and paddled south. Instead of camping, we travelled in style by dining in restaurants and staying at B&Bs. I was curious to know if I could plan a similar trip in the future with classmates and spouses. In Merrickville we stopped to admire a 34’ 15-man canoe at the Ron Johnstone Paddling Centre. The germ of an idea formed in my mind. Richard left me in Smiths Falls to go back to work, leaving me to paddle solo the rest of the way. After stops at the family cottage, Chaffey’s Locks and Cranberry Lake I reached the dreaded River Styx in a howling headwind. There was nothing for it but to abandon the plan and phone the cavalry. Wendy arrived a few hours later and we drove the final stretch into Kingston. The 1999 trip had started out as a whim which then turned into a reconnaissance expedition for a class canoe trip. But something important was missing. The sight of that beautiful big canoe in Merrickville crystallized a thought that had been in the back of my mind for several years. After the 25th Reunion of the Class of 71, Secretary 8926 Ray Hook announced that our class had donated a paltry $1,500 to RMC over twenty-five years. He started asking for opinions regarding financial support. Many ideas were tossed about but there seemed to be a sizable consensus on athletics. I had thought no more about it until the day I saw the big canoe. Then I realized what had been missing. The class canoe trip would be more than just fun – it could raise money for athletics. What better symbol of teamwork and fitness than a canoe with fifteen paddlers? After Merrickville, I abandoned the idea of a fleet of small canoes and eagerly embraced the potential of one big canoe. The more I paddled along, the more I realized that the idea, and the canoe itself, were bigger than our class. People lead busy lives and so it would be difficult to fill the fifteen seats for a week. More importantly, our fundraising ability would be limited. It made more sense to welcome all Ex-Cadets into the canoe. This eventually became a hallmark of La Chasse-Galerie: a canoe filled with Ex-Cadets from any class, relatives and friends, men and women, English and French-speaking, young and young at heart. The final trip included two serving cadets from RMCC and RMCSJ. Could it work and what would it cost? I thought about all the logistics involved. Paddling a canoe solo was much different than guiding, accommodating and feeding a group of fifteen on the water safely and happily for one week. What if we hit a deadhead in a storm on the River Styx or capsized going around Point Frederick? And could we raise enough money to make it worthwhile? I took the chance. When I arrived at RMC in 1999 I broached the subject with John Coo, the fundraising coordinator for the RMC Foundation. He was supportive so I contacted Ray right away and suggested that we could use a canoe trip as an appropriate vehicle to raise funds for athletics. We would time the trip to arrive at RMC just before the 2000 Reunion Weekend. Classmates and others could donate money in the names of the paddlers. Ray agreed and then told the class that, unless there were any better ideas, we had a plan. I went home and started hammering out the details. 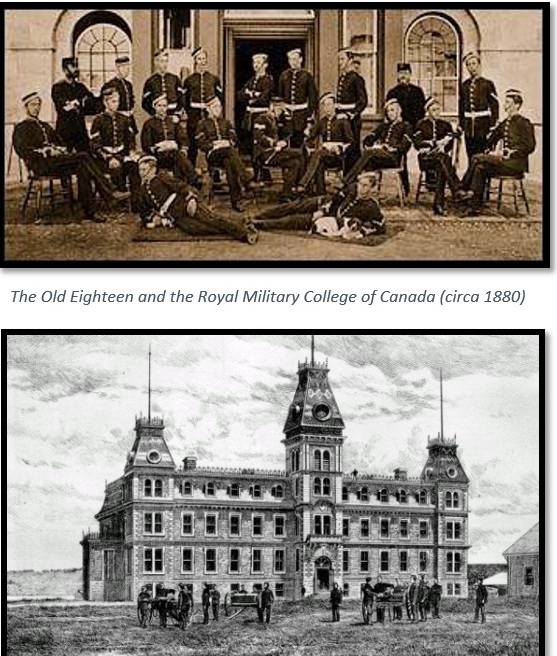 In December 1999 I attended the Vancouver Island Ex-Cadet Club luncheon at the Bay Street Armoury in Victoria. I was a new recruit surrounded by my seniors. Somewhat nervously I stood up and explained my plan for a fundraising canoe trip to RMC the following September. To my astonishment, Stan Mitchell, Les East and Dave Bindernagel leaped over the sofas in order to be first in the canoe. I was so trilled for the privilege to twice be a crew member. Reading the history brings back great memories. A little like RMCC it feels a lot easier in hindsight. Wendy and Geoff may never know how much this has meant to so many of us. All the warm fuzzies aside this undertaking has provided a legacy for future excellence at the Colleges. I have been Fundraising for a very long time and I understand the impact of a Brand! It would be a shame for La Chasse Galerie Brand to be shelved because we all got too old! This is a No Brainer for a younger class to carry On. It is well documented with extraordinary attention to detail. Why bother reinventing the wheel when this one is perfectly round.